We eat a lot of ground turkey at our house, so I am constantly trying to come up with creative ways to cook with it. My go-to recipes are usually tacos, turkey burgers, meatloaf, and meatballs. When making turkey burgers, meatloaf, and meatballs I follow the same general recipe, a little liquid, a binder, and a bunch of herbs and spices. I always have a fully stocked supply of dried herbs and spices and a few months ago when I was in my Amazon.com shopping addiction phase I stocked up on gluten free bread crumbs (I wish I could say I was completely out of the phase, but that would be a lie…). Other ingredients that I like to add that we usually already have in the refrigerator are; eggs, milk, a little bit of ketchup, and depending on my mood, Sriracha sauce, Tabasco, and even a little mustard sometimes. One of the great things about making recipes like meatloaf and meatballs is that once you have a general recipe for them you can play around with the seasonings and rather than go out and buy a bunch of ingredients you will only use a little bit of once, you can use things that you already have in your house. I come up with some of the best recipes when I’m too lazy to go to the store or I want to use up some ingredients I already have in the pantry. One of the reasons that I started this blog was so that I could have a record of all my recipes, and I’m so happy I wrote this one down, because these meatballs are seriously the best batch I have ever made! They are really flavorful and moist and I will definitely be making this exact recipe again! I hope you enjoy it! *I was able to make 14 nice sized meatballs out of this, but you could make more or less depending on the size. In a large bowl, add the ground turkey, salt, pepper, red pepper flakes, thyme, rosemary, parsley, garlic, paprika, ketchup, breadcrumbs, milk, and egg. Mix with your hands until they are combined. Heat up a large pan on medium heat and add olive oil. 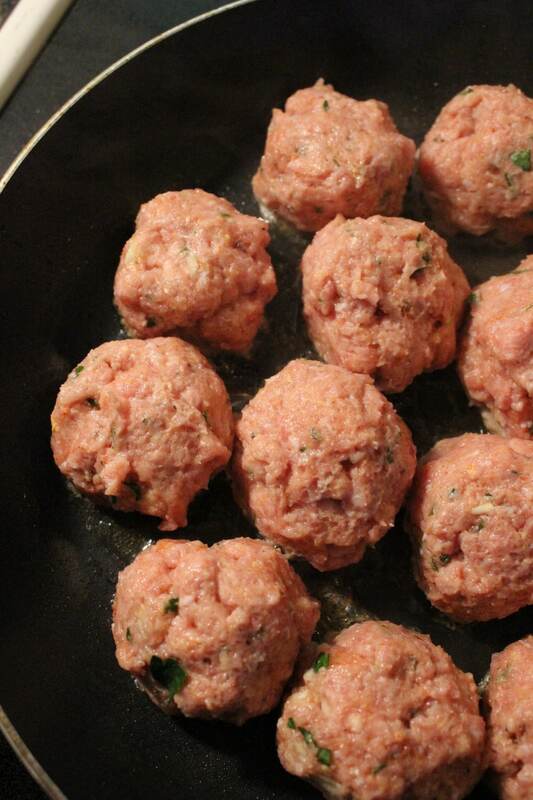 Once pan is hot, shape meat mixture into meatballs and drop into the pan. 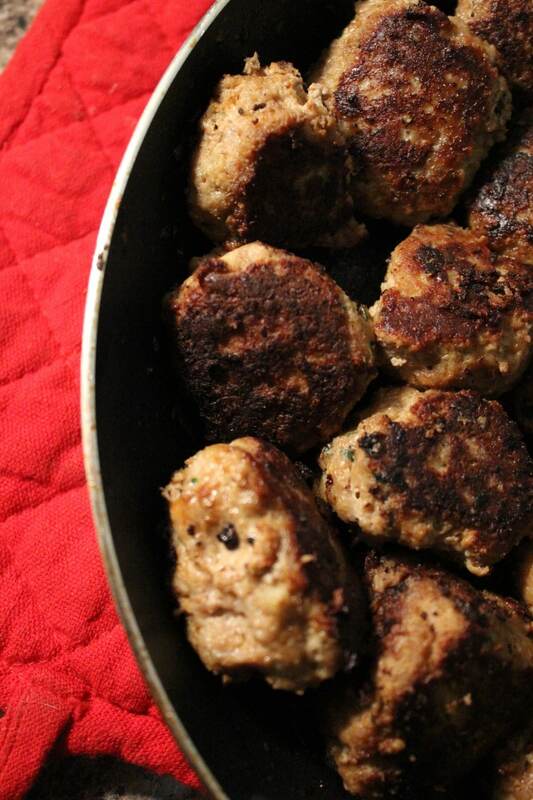 Cook for about 20 – 25 minutes turning meatballs every so often so that all sides brown. Cook until meatballs are cooked through. Once meatballs are finished cooking, add a few cups of tomato sauce into the pan to warm. You just need enough tomato sauce to coat the meatballs and to scoop into the subs. Pre-heat oven to 400 degrees. Cut rolls in half, (but not all the way so that the filling does not fall out), stuff with meatball and tomato sauce mixture. Top with grated cheese, I like a lot! Place subs on a sheet pan and put into the 400 degree oven for about 5 minutes, or until cheese is melted and bun is crispy. Garnish with fresh parsley, if desired. 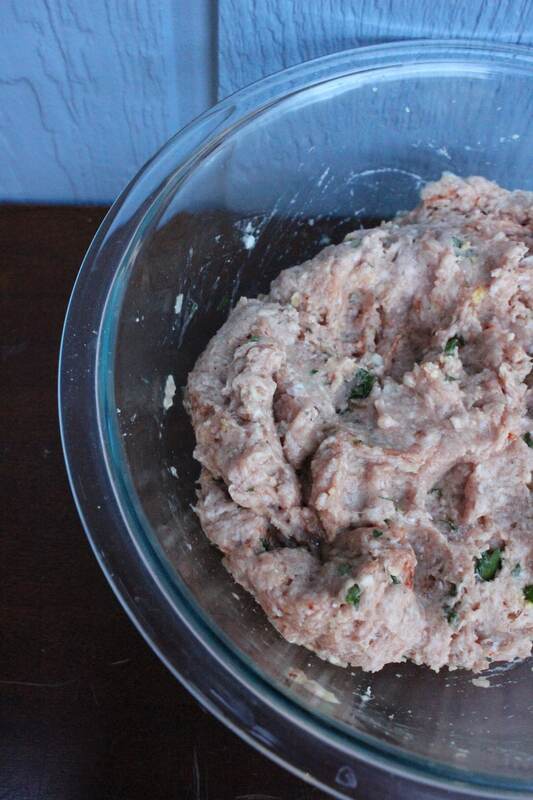 This is, by far, my favorite way to eat ground turkey! Thanks Leigh!! I really love ground turkey and I think I need to post some more ground turkey recipes soon! !